If there is one channel that reflects real-time category trends and social movements, it’s digital. Whether that’s ‘Brad Pitt and Angelina Jolie’s break up’ or ‘Pret’s new Christmas sandwiches’, you can see them instantly. This is an advantage to marketers when thinking about PPC messaging, placement and strategy. For example, I received a mobile notification just hours after the US election results from the well-known travel provider Ryanair who’ve been responsive to recent political activities. The message was “NO ONE TRUMPS OUR FARES! 1,000,000 SEATS FROM €9.99”. Very clever, and it validates the point above. While there are many unpredictable topic/category search spikes, there are also more certain trends which, whether you’re a newbie to the PPC world or an experienced practitioner, are predictable and can offer opportunities – particularly if you or your client is in the retail business. Here are some key things to think about before the season starts and celebrations hit their peak. Starting with the most basic and straightforward advice: plan your media spend wisely! This means, looking into Google Trends as well as historical year-on-year data to spot search interest spikes and troughs. Hot summer days in July mean very little search interest for ‘skiing equipment’, so you might pause paid activity around that term and save the money for a real push later in the year, or just highlight some other aspect of your service/product during. But remember, hot days might not be the best time to advertise sunglasses either, as most people will probably already be out enjoying the sun in theirs. Before going into a new month, it is important to do the same analysis, only deeper, i.e. looking at search trends day-on-day and week-on-week. This analysis can reveal things like: a week before, ‘Christmas’ search interest is at its the highest, dying away completely only one day after Christmas. This allows us to plan budget allocation and maximise ad visibility during the times when demand is highest. Similarly, there would be greater interest after pay days and before/on Black Friday. If you’re the only one responsible for account management and planning to take a well-deserved Christmas break, remember that your best friend is automation and Adwords rules! Campaign budgets are often left to spend high amounts to maximise impression share over those crucial days, while teams forget to pull it back before the new month starts, thus spending a big proportion of next month’s budget in the first few days of the month (New Year’s is a good example). The way people search on search engines varies from individual to individual. Even the same person develops new methods and habits, so it’s important to do regular search query reports (SQRs) and update your keyword lists. 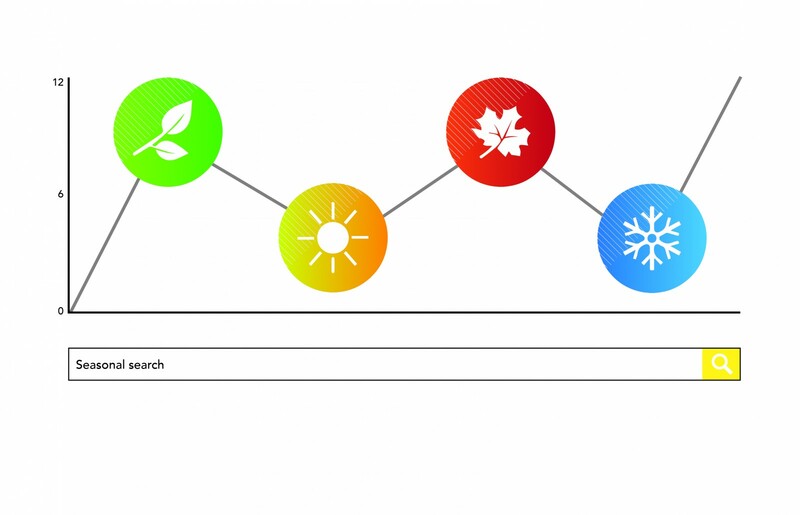 There are various factors which influence what and how people search, with seasonality and national holidays such as Christmas being a primary example. During the festive period, people tend to search more generically as they usually don’t have a clear idea of what they want, so they might be looking for something like, ‘best Christmas toys for boys’, ‘latest drone models’, ‘Valentine’s day present ideas for her’ etc. rather than ‘Syma drone 1772’ or ‘Playstation 4 with Grand Turismo 4’. People tend to add festive keywords to their product/service searches: for example ‘Christmas board games’. Although these would be picked up by your broad match modified keywords, it is a good idea to create season/festival-specific campaigns. This allows you to serve tailored ads. You just need to remember to add the festive word or phrase as a negative keyword to your normal campaign, to avoid campaigns competing with each other. If you do choose to go after generic keywords (‘stocking filler ideas’, ‘Easter gifts’, ‘Black Friday deals’ etc. ), unless your budget is high and ROI flexible, you may not be able to compete. An alternative is to use remarketing lists for search ads (RLSA) to bid on new keywords you can’t make profitable throughout the year. For example, key phrases such as ‘toys for boys’ may be too expensive during the year, so you don’t bid on them. However, by creating an RLSA campaign with this highly competitive keyword around Christmas, allows you to target previous visitors with a higher affinity to convert with a tailored message on a keyword, otherwise unprofitable. Tailoring your ads as much as possible to the search queries is the dream! However, there will, of course, be other brands using the same strategy, so there might still be a need for some uniqueness. Yes, they’ve been around for a while, but these ads aren’t commonly used and they’re perfect for creating a sense of urgency and exclusivity. Phrases like, ‘Offer Ends Soon’ and ‘Don’t Miss Out!’ work well, but giving a specific timeframe can push urgency even more. NB: Remember to use one alternative ad with your countdown ad, otherwise they are not eligible to run – Adwords needs a ‘security’ in case the countdown ends (I speak from experience here J). Planning and preparing in advance, before certain search trends fluctuate, is crucial and, especially for retailers, can determine whether or not they reach their sales targets. The tools available (Google Trends, Adwords keyword planner), the historical data and some common sense are all it takes to prepare your accounts for search trend changes and save yourself from a festive headache. Also, try to be more responsive with the sudden topic spikes and use them to your advantage. Everyone loves seeing a smart advertising campaign that ties in with real-time events.